With its dramatic coastline and panoramic views from Mount Soledad, sightseeing is one of the most popular activities in La Jolla. Otherwise you'll find a community rich in heritage and culture along with some of the best beaches in the country! The streets of Prospect, Girard, and Hershel encompass The Village; a bustling business district offering world class dining, one-of-a-kind boutiques, art galleries, jewelry shops and romantic, old world hotels. Shopping in La Jolla tends toward the unusual and upscale; designer fashions, expensive jewelry, ethnic artifacts, priceless antiques, oriental rugs and exotic cars. Prospect Street is ground zero for fine-dining, but don't overlook the excellent options in UTC, Bird Rock and the La Jolla Shores. The most popular offerings are fresh seafood and Mexican cuisine, but you can find anything from scrambled eggs to sushi among the many and varied eateries throughout La Jolla. The surrounding residential community is a charming mix of turn-of-the-century Spanish architecture, eccentric modern designs and everything in-between. 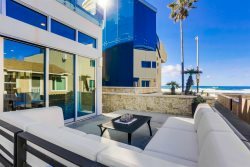 Rising over 880 feet from the ocean to become a prominent landmark just to the east of La Jolla. 360-degree panoramic views overlook La Jolla, and much of San Diego including downtown, with vistas all the way to Mexico. The top of the mountain is adorned with the Mount Soledad Easter Cross and Veterans Memorial, with 6 concentric walls of black granite engraved with thousands of names, photographic etchings and remembrances of war veterans from all branches of the US Military. Sunrise and sunset are two special times to visit. The museum has a permanent and changing collection of more than 3,500 post-1950 American and European works, including paintings, works on paper, sculptures, photographic art, design objects and video works. $10 general admission, age 25 and under free. www.mcasd.org 700 Prospect Street, 858 454 3541. Th 11am - 7pm, F-Tu 11am - 5pm, closed Wednesdays. University of California, San Diego is in fact six colleges in one campus, a unique situation in the UC system, patterned after Oxford and Cambridge. Artworks and sculptures are sprinkled throughout, and architecturally interesting structures abound, notably the Geisel Library, named for the noted author Theodore Geisel (Dr. Seuss). This library is truly outstanding and was used as a UFO in a movie. You can descend a tunnel in the basement of the old Cave Store to or rent kayaks to visit Sunny Jim's Cave that opens to the ocean. Here you'll find a variety of native sea birds nesting on the cliffs and sea lions sunning on the rocks below. www.cavestore.com 1325 Cave St. 858 459-0746. A small beach tucked between adjacent sandstone cliffs. Extraordinarily beautiful, La Jolla Cove is one of the most photographed beaches in Southern California, and is within a short walk of Prospect St. and The Village. Water visibility at the Cove can sometimes exceed 30 feet, making it a popular location for scuba divers and snorkelers. La Jolla Cove lies within the San Diego La Jolla Underwater Park Ecological Reserve, which helps to ensure that marine life remains plentiful. A scenic two mile long, sandy beach just north of La Jolla shores, situated at the base of the Torrey Pines cliffs that are up to 300 feet high. Access from above is somewhat difficult due to the lack of improved stairways. The safest access is from adjacent beaches to the north and south, but can sometimes be obstructed by high tides. The cliffs are unstable and slides have occurred without warning, so it is best to stay well away from them. During certain swells, Black’s has some of the best surfing on the west coast. Although not officially sanctioned, there is a section of Black's Beach dedicated to nudism. Officially named Tourmaline Surfing Park, this wide, sandy beach sits at the base of Tourmaline Street immediately south of Bird Rock in La Jolla and stretches to the Crystal Pier in Pacific Beach. Typically the surf is more gentle, good for both swimming and surfing. There is a public parking lot with restrooms as well. Located at the southern border of La Jolla and Pacific Beach. The rocky stretch of coast is lined with multi-million dollar homes, with nearby local businesses and restaurants. The small, quiet parks at Bird Rock, come with spectacular views of the beautiful houses overlooking the many reefs, surf breaks and small coves of the rugged shoreline. La Jolla Hermosa Park is at the intersection of Camino de la Costa and Chelsea Avenue, and Calumet Park on Calumet Avenue at Colima Court. These parks tend to be very quiet and uncrowded — a great place for an afternoon picnic. There are access stairs to the shoreline at the North Bird Rock vista point on Camino de la Costa, and at the foot of Bird Rock Boulevard. Much of La Jolla has a rocky coastline, creating good conditions for viewing marine life at low tide. A 1.0 foot tide or lower is OK, but you will have a better chance of seeing more marine plants and animals when the tide is minus. If the weather is stormy or the surf is otherwise high, it is best to postpone visiting the tide pools until calm weather, since you won't see much, even at low tide. Bird Rock: The south end of La Jolla north end of Pacific Beach. Hermit crabs and sea snails are very common here. On a good low tide, you will have a chance to see sea urchins and brittle stars or maybe an octopus. Shell Beach/Hospital Reef: South of Scripps Park and Children’s Pool. Fairly good tide pool but it must be a very low tide. Dike Rock: Just to the north of Scripps Pier near Black’s Beach. Here you may have a good chance of spotting a star fish or an octopus on a good minus tide. Please avoid stepping on the marine life, carefully turn rocks back over after examining, do not remove attached animals, and return others to the same tide pool where you found them!